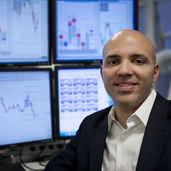 About me Former Director Futures & Forex Trading at SMB Capital, a world class proprietary trading firm and educator. I'm also a Chartered Market Technician (CMT), which is a professional designation from the Market Technicians Association. Litecoin: 48 And 56 Key Levels For Profit Taking? Litecoin: Looking To Add Around These Supports. Bitcoin: This Formation Hints At Broader Recovery? QQQ: Check The Roadmap. Major Support Test. Bitcoin: Bears Are Strong But On Look Out For This Key Reversal?